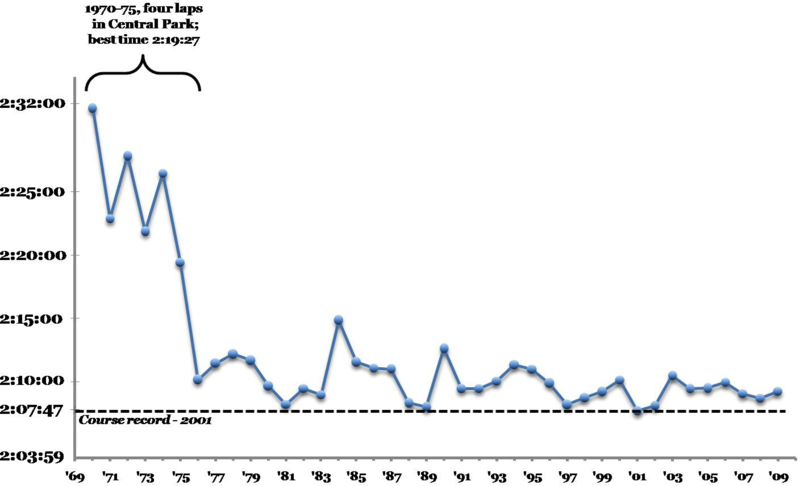 So in 1976 the current race course was adopted, the one that passes through all five boroughs, and since then the average winning time has deviated year-to-year by only about 90 s and has gone below 2:08 only once (in 2001 when Jifar set the current course record). The blips, for your information, are from 1984 when the ambient temperature was in the upper 70s F with 60-90% humidity, and 1990, when the max temperature on the course was 79 F.
One of the readers, cassio598, suggested analyzing the data from 1976 to the present, because then it appears that the winning time creeps lower over time. And the verdict? The regression line for these data does indeed move in a downward direction, however the coefficient of determination (“r-squared”) is only 0.16, which does not suggest a very good fit. But the bigger issue is that since 1981 there have been six times that are very close to 2:08, and so it is hard to conclude that the times are getting faster when almost 30 years ago the winning time was one minute faster than the winning time this year. Perhaps the really interesting comparison comes from looking at the the “current” average times of all the big city marathons—London, Boston, Berlin, Chicago, and New York—and see how the times of this decade compare to the “average” times from a decade ago. So what you see below is the average winning time from 1990-99 (blue column) compared to the average winning time from 2000-09 (red column) for all of the above-mentioned races. Recall that Chicago, London, and Berlin are flat courses, while NYC and Boston are not flat. You can see that the winning time for all the flat courses has decreased by about 2.0% while NYC and Boston have remained more or less the same. How is that? Even when scrutinizing the Boston data, it comes out that in 1983 the last American to win, Greg Meyer, ran 2:09:00. It also turns out that the average winning time for the Kenyans (and a Kenyan has won Boston many many times!) is 2:09:32. This all leads me to believe that the less than flat nature of these two courses may “neutralize” the speed of the East Africans. How this works we have not figured out just yet, but how can it be that while the average best American marathon time is so many minutes slower than the best African times, yet on courses like these we had runners over 20 years ago running just as fast as the Africans are running now? Conservative race strategy?Perhaps the hilly nature of Boston and New York dictate a more comfortable (i.e. ~2:09) pace for the first half, as no one wants to blitz the first 20 km in 57 min only to have the wheels come off during any bumps in the second half. One question we asked ourselves after New York was, “What if Wanjiru ran New York. . .?” Because if he ran aggressively like he ran Beijing, London and Chicago, at halfway he might have had only two runners with him and not seventeen others as was the case in New York. With all due respect to Meb, if the 21.1 km split was 1:03:00 and not 1:05:11, he and most of that pack would likely not have been there to contest the race around Manhattan. Having said that, however, it will be really interesting to see how Meb goes next year, because he did set a half marathon PB this year with a 61:00 back in April. One thing that also comes out of the graph above is that Berlin has been the fastest course around for years. We all know why the average time since 2000 is about 2:06:20, but even in the 1990s Berlin was almost one minute faster than London and Chicago. Seeing as how the margins are so tight now, it seems that Berlin is perhaps the course most likely to produce the next marathon world record. Previously, when the record was “softer” and still above 2:05, the turns, bumps and cobbles of courses like London were not really obstacles. Now, however, the record is so close to the limits of the current crop of potentials that even having to take several extra 90 degree turns will be meaningful. Dubai may become the new player on the record scene, and along with Berlin, has become one of Gebrselassie’s two paced record attempts each year (as it will be in 2010). So it may have the fastest time of all, but being such a recent race, and really only by virtue of the fact that Geb has chosen it, it hasn’t proven itself over decades, yet. The answer to the title of this post: YES!If we looked only at New York and Boston we might conclude that, no, times are not getting faster, because in those two races there seems to be a real limit in the form of the race course. While a 2:07 in either of those races will almost guarantee you a win and probably the course record too, a 2:07 in London is only good enough to squeeze into the top five and probably a podium in Chicago, but no guarantees you will be victorious. But obviously the times are getting faster, because we have seen a progression of world records in 5000 and 10000 all the way up to 42.2 km, and no one would argue with that. What we have stated before is that the marathon class of 2009 has been particularly fast, and that actually warrants an analysis on its own—between Kibet’s and Kwambai’s 2:04:27 in Rotterdam, Wanjiru’s 2:05:10 in London, Gebrselassie’s 2:06:13 in Berlin, Wanjiru’s 2:05:41 in Chicago, and even Vincent Kipruto’s 2:05:47 in Paris, the average winning time this year is 2:05:28, which might be the fastest average for one year!